During the session, participants shared their views on various economic themes such as the macro-economy, agriculture and rural development, employment, health and education, manufacturing and exports, urban development, infrastructure and connectivity. Finance Minister Shri Arun Jaitley thanked all the participants for their thought-provoking suggestions, says the official release. In his intervention, the Prime Minister thanked various participants for their suggestions and observations, on various aspects of the economy. In particular, he appreciated the quality of suggestions that had come from various subject experts. The meeting was attended by several Union Ministers who look after economic subjects. 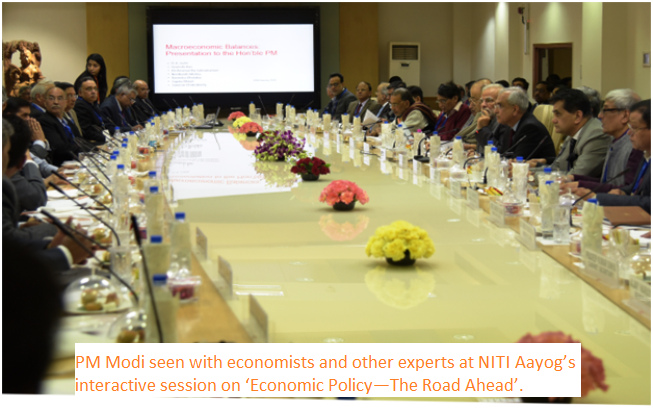 The Vice Chairman NITI Aayog Shri Rajiv Kumar, and senior officers from the Union Government and NITI Aayog were also present.